Lella Vignelli, who enjoyed a lifelong collaborative working relationship with her husband, the late Massimo Vignelli, and whose Vignelli Center for Design Studies placed Rochester Institute of Technology onto the international forefront of design studies, died Dec. 22 in Manhattan after a long illness. She was 82 years old. In 2010, Massimo and Lella Vignelli donated their extensive career archive to RIT, where the collection is permanently archived as the major resource at the Vignelli Center for Design Studies. The center’s goals are to advocate design excellence at RIT and beyond through innovative programming, supported by extensive archived holdings of design exemplars. Lella Vignelli was an honorary RIT Board Trustee and recipient of the Presidential Medallion, one of the university’s most prestigious awards. The founder of Vignelli Associates, an award-winning, multi-disciplinary design studio in New York City, she was predeceased by her husband, Massimo, arguably the greatest designer in modern history, who died in 2014. Mrs. Vignelli was born Elena Valle in Udine, Italy, in 1934. In 1958, she received a tuition fellowship to the School of Architecture at MIT in Cambridge, Mass. A year later, she joined Skidmore, Owings & Merrill in Chicago as junior designer in the interiors department. After receiving her degree from the University of Venice’s School of Architecture, she became a registered architect in Milan in 1962. The following year, with Massimo, she established the Vignelli Office of Design and Architecture in Milan. In 1965, she became head of the interiors department for Unimark International Corporation in Milan and then in New York in 1966. In 1971, the Vignellis established Vignelli Associates, where Lella Vignelli initially served as executive vice president and later as chief executive officer. Seven years later, the couple formed Vignelli Designs, a company dedicated to product and furniture design, where she served as president. Lella Vignelli’s work was widely featured in design publications across the United States and abroad. Noted examples have been included in the permanent collections of numerous museums, including the Museum of Modern Art, the Cooper-Hewitt Museum and the Metropolitan Museum of Art in New York City; the Musée des Arts Décoratifs in Montreal; and Die Neue Sammlung in Munich. The Vignellis’ work also was the subject of two feature-length TV programs that have been televised worldwide. A monographic exhibition of the Vignellis’ work toured Europe between 1989 and 1993, and was featured in Moscow, London, Munich and Paris (among other cities). 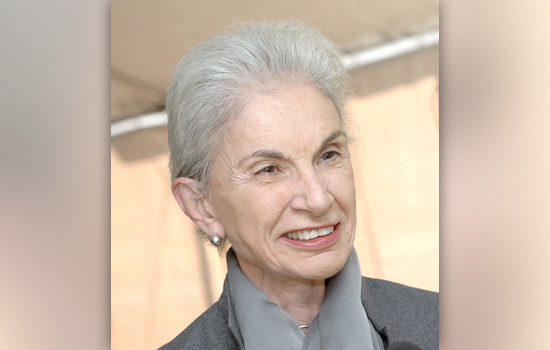 A renowned member of the Industrial Designers Society America (IDSA), the American Institute of Graphic Arts (AIGA), the International Furnishings and Design Association (IFDA), and the Decorators Club of New York, Mrs. Vignelli was a frequent speaker and juror for national and international design organizations. Among her honors and awards were the American Institute of Architects (AIA) Industrial Arts Medal (1973); AIGA Gold Medal (1983); Interior Design Hall of Fame (1988); National Arts Club Gold Medal for Design (1991); Interior Product Designers Fellowship of Excellence (1992); The Brooklyn Museum Design Award for Lifetime Achievement (1995); and The Russel Wright Award for Design Excellence (2001). In 2003, Lella and Massimo Vignelli received the National Design Lifetime Achievement Award. She also was the recipient of honorary doctorates from the Parsons School of Design in New York City and the Corcoran School of Art in Washington, D.C. The Vignellis were trustees of RIT when they donated their extensive career archive. The collection is the major resource at the Vignelli Center for Design Studies. The archive, building and programming serve as a permanent remembrance of the renowned designers. The center features an archive of the Vignellis’ design work over their 40-year career, along with an extensive collection of original source materials, serving as an international resource and is accessible for study. In addition to the archive storage areas, the nearly 19,000-square-foot Vignelli Center also houses offices and the Benetton Gallery, which features “Design is One,” an exhibit comprised of select pieces from the Vignelli collection. The center serves as a hub for design education, scholarship and research, expanding the scope of the programs offered through RIT’s School of Design. The school offers degree programs in graphic design, industrial design, interior design, new media design and imaging and computer graphics design. According to Remington, funeral arrangements are pending.